As with any career, volunteer mentors offer guidance, care, compassion, professionalism and a level of excellence that help you progress in your chosen field be it annual fund, public relations, major gifts, planned giving or special events. So take the time and invest in yourself and your career, you and your organization will reap the benefits! The AFP Aloha chapter offers a mentoring program to provide chapter members with the opportunity for one-on-one assistance that will enhance their knowledge and skills as development professionals. Participation as a mentee in this program is available to members of the AFP Aloha chapter who have worked as a full-time paid development professional at a nonprofit organization for a minimum of one year. 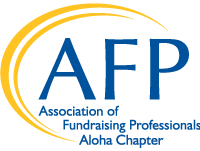 Participation as a mentor is available to members of the AFP Aloha chapter with demonstrated expertise in various areas of fundraising. CFRE certification is preferred, but not required. Participation as a mentor in this program may be counted as 10 points toward CFRE certification or recertification. Please contact admin@afphawaii.org with any questions. Step 1: Email admin@afphawaii.org, include “Find a Mentor” in the subject line. Send email and await our reply. Step 2: AFP will match a mentor to your interests. You and your Mentor will receive an email of introduction and your Mentor will follow up to find a mutually convenient time to meet. Step 1: Email admin@afphawaii.org, include "Become a Mentor" in the subject line. Send email and await our reply. Step 2: Once you have registered, your information will reside in a database that is organized by keywords that you have identified in both the “Areas of Expertise” field AND in your profile. When a Mentee requests a Mentor, AFP will match the Mentee with the Mentor who has the expertise he/she is looking for. Step 3: You and your Mentee will receive an email of introduction and you will follow up to find a mutually convenient time to meet. Email admin@afphawaii.org to connect today!